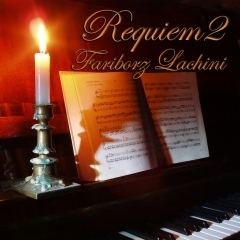 Requiem 2 is the second in a series of collections of original classically-influenced piano solos by The Godfather of Iran’s Contemporary Piano, Fariborz Lachini. A composer/pianist who effortlessly combines the musical styles of classical European traditions and his own Middle Eastern roots while mixing in touches of Western pop and new age styles, Lachini bridges the various cultural divides with music from the heart that heals, soothes, and inspires. Lachini’s music has a storytelling element with many visual suggestions, so it comes as no surprise that he has composed the music for more than a hundred films, making him a very well-known artist in his native land and a rising star in other parts of the world. Extraordinarily prolific, Lachini never seems to repeat himself and produces albums of exceptional beauty with each new release. Requiem 2 begins with the deeply-moving Sad Ballerina. 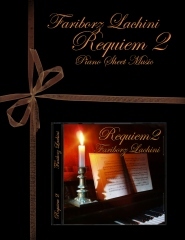 A master at creating melancholy piano solos, Lachini suggests a young dancer alone on a darkened stage dancing to her sorrows with music only she can hear. Fluid, graceful, and heartbreakingly sad, it’s an incredible beginning. \"Blue Orchids\" is more of a still life in shades of blue and white. Reflective in mood and elegantly performed, it speaks softly and from the heart. \"Only Sound Remains\" is an 8-minute beauty that seems to be a soliloquy of sorts, and it is easy to picture a lonely pianist pouring his heart out in the middle of the night perhaps by the muted light of a candle. I hear a strong influence of Chopin and maybe Mendelssohn’s Songs Without Words - very touching without becoming overly sentimental. \"Crossing\" is one of my favorites. Passionate yet understated, I hear a ghost of Chopin in the background. I love \"Butterfly In Snow,\" a tender ballad with a tragic quality. Can the delicate butterfly survive in such cold? One senses a struggle to continue, being in the wrong place at the wrong time. \"Flying Dream\" is a little different from the other pieces in that it conveys a floating feeling and a sense of freedom from cares or worries. Very comforting and soothing, it’s a lovely way to end a most enjoyable musical experience.